July 17, 2017 (LBO) – LAUGFS Gas Bangladesh, part of the diversified Sri Lankan multinational LAUGFS Holdings, said it is planning to set up a cylinder manufacturing plant in Bangladesh. LAUGFS Gas Bangladesh currently operates a world-class LPG import, bottling and distribution facility in Mongla Port, the company said. It serves domestic and industrial segments with its 12kg cylinders for households and 12kg and 45kg cylinders for commercial and industrial customers under the brand name LAUGFS Gas. The company says it is also the pioneer in Auto gas in Bangladesh and supplies LPG to automobile service stations across the country. LAUGFS Holdings Chairman W.K.H. Wegapitiya speaking at an event said they are planning to strengthen their presence in Bangladesh further. “As an energy conglomerate with a strong footprint within the region, we plan to invest significantly in Bangladesh over the next 3 years,” Wegapitiya said. He was speaking at a corporate dinner reception hosted by the company in Dhaka, Bangladesh which was graced by President Maithripala Sirisena. The event coincided with the state visit by the President and a high profile delegation to Bangladesh. The dinner reception was graced by a gathering of eminent government officials and business leaders from both Sri Lanka and Bangladesh. 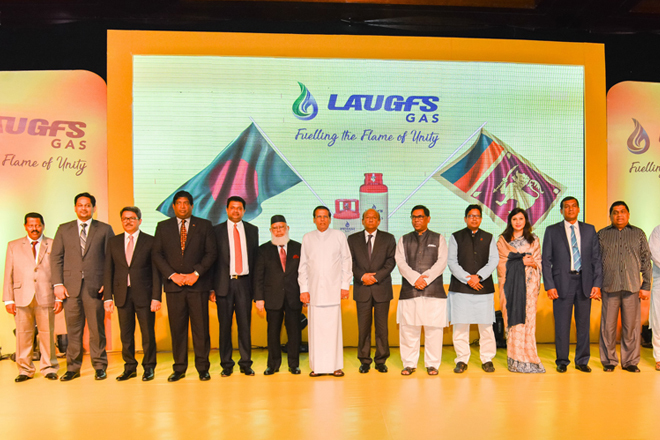 LAUGFS Gas entered the Bangladesh market in 2015 with the acquisition of Petredec Elpiji Limited, and is one of the largest LPG downstream players in the country. The company imports and distributes over 50,000 MT of LPG every year in Bangladesh and operates an expansive and a fast growing distribution network across the country. LAUGFS is a diversified conglomerate with a strong presence across more than 20 industries in the Power and Energy, Retail, Industrial, Services, Leisure, Logistics and Real Estate sectors. Its presence in the Power and Energy sector includes Liquid Petroleum Gas, energy logistics and infrastructure, petroleum retailing, as well as renewable energy. It has a strong presence in LPG downstream and midstream activities within the region, which includes LAUGFS Gas that engages in downstream activities and LAUGFS Maritime, which operates its own fleet of LPG vessels providing energy logistics services within the region. It also has LAUGFS Terminals, which is currently setting up one of the largest LPG import and export terminals in South Asia.